Our IELTS writing plans provide an essential guide to writing a good response to both Academic IELTS and General Training IELTS test questions. The plans will help you to generate ideas and show you how to organise them into clear paragraphs, so that your writing has a logical progression and is easy to follow. Just click on any question title below to see the plan and sample answer. There are 12 free plans for you to look at and if you SIGN UP for free iPass membership you will gain access to 12 more! 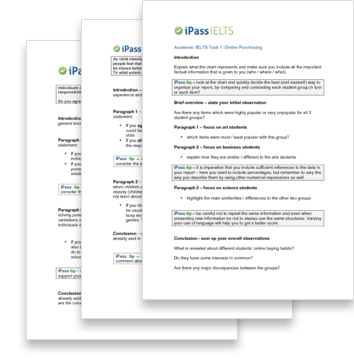 iPass students enrolled on ANY course will gain access to the complete collection of writing plans!